This is the version of the page on 2006 October 16. 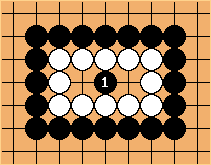 A nakade (ナカデ or 中手) is a play inside an opponent's eye. Black can kill this group by playing nakade at . The nakade sequence, - , makes seki. The nakade, , makes the result of the semeai a seki. Unsettled eyeshapes are those eyeshapes where a killing nakade is possible. 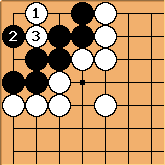 Basic living eye shapes are those where a killing nakade (in one move) is not possible. Dead eyeshapes are those where a nakade is not needed to kill: the group is already dead. Eye shapes in the corner or on the side: see rectangular six in the corner and bent four in the corner. The presence of cutting points and shortage of liberties: see Nakade example 1 and Nakade example 2. For several possible reasons, the eye shape may contain more enemy stones. Any eye shape which is filled with stones so that almost filling it with a killing shape is inevitable, is dead. These patterns are listed at killable eyeshapes. Now neither group can approach at a without putting itself in atari.